Until the early 1970s, Ketchopulos Meat Market occupied the space at 19 Broadway that is now the location of Rockport House of Pizza. By all accounts, the market was a favorite of locals and tourists alike. But it was the flowers that made it so memorably picturesque. 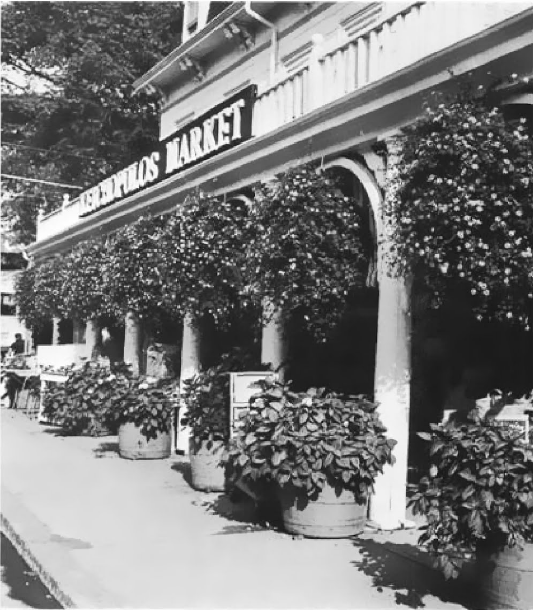 From at least the 1920s, the market, run by George and Mary Ketchopulos, had pots of flowers decorating its front from spring through fall. But around 1940, Mary added to the display by hanging a trailing purple lantana beneath one of the decorate arches. She received so many compliments that, when the next summer came around, she added nine more lantanas with blue tubs of hydrangeas at the base of each post. An undated picture of the market from the Outdoor Gardening book. Familiar to visitors to picturesque Rockport, Massachusetts, in the summer are the trailing purple lantanas along the front of Ketchopulos Market. Thirty-three years ago, Mrs. Mary Ketchopulos hung a single specimen in one of the arches of the facade which faces northwest. She received so many compliments that the next summer, she added nine more with blue tubs of blue hydrangeas at the base of each post. Here, everything is regularly watered twice a day and three times in very hot weather. Once a week, plants are fed a liquid fertilizer. Over the years, visitors from many states have stopped to admire these container plants. From the arches of the colonnaded front which abuts the sidewalk, suspended lantanas drip down between tubs of hydrangeas, framing the display of fruits and vegetables whose vivid harvest colors are multiplied by an overhead mirror. Its gayety and beauty delight the flower lover and invite the gourmet. The market as depicted in a 1925 painting. 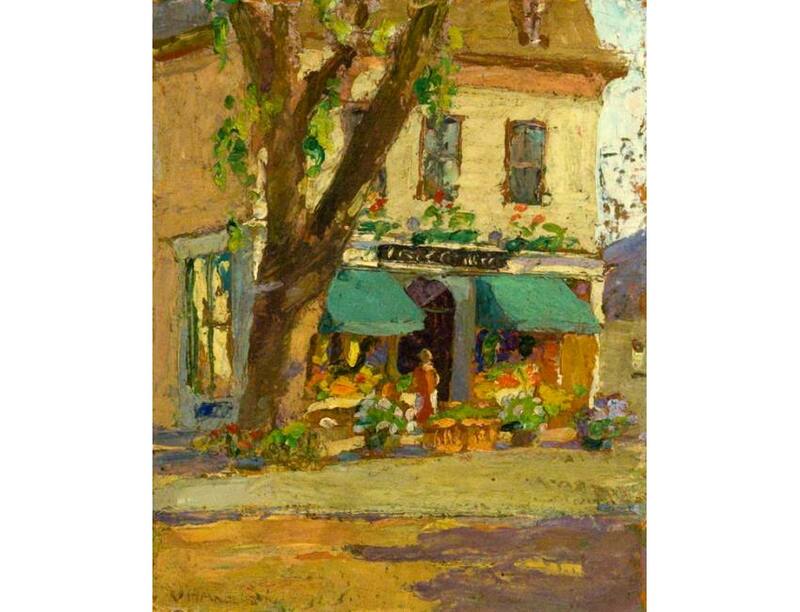 Artist Viola Anderson depicted the market in a 1925 painting. As you can see from the picture to the right, there were flowers on display even then, before the arched overhang was added to the building. As best as I can determine, the market opened in the early 1920s and remained in business until the early 1970s. Just to the right of it was a Jenny service station, the roof of which you can see in this postcard. The Good Morning Gloucester blog has a picture of the market as it appeared in 1931. Mary Ketchopulos died in 1964. She was born in Tripolis, Greece, and came to the United States around 1912. George and Mary had two sons and a daughter. I believe that George predeceased Mary. Somewhere along the line they dropped the “Meat” from the name. It was pretty much a full service market as I remember it. My mother shopped there as long as it was open, as nearly as I can remember. She referred to it, as I suspect a lot of people did, as “Kechops.” A great place.